Take the stage with the Roland FP 10 Digital Piano. Featuring Roland's acclaimed sound and touch, combined with all the modern features, all in a professional-quality 88-note instrument. The FP 10 boasts Ivory Feel keys, Roland's SuperNATURAL piano sound engine that's supported by a powerful amplifier and on-board sound system, as well as dual and twin piano modes and a wide selection of non-piano sounds. 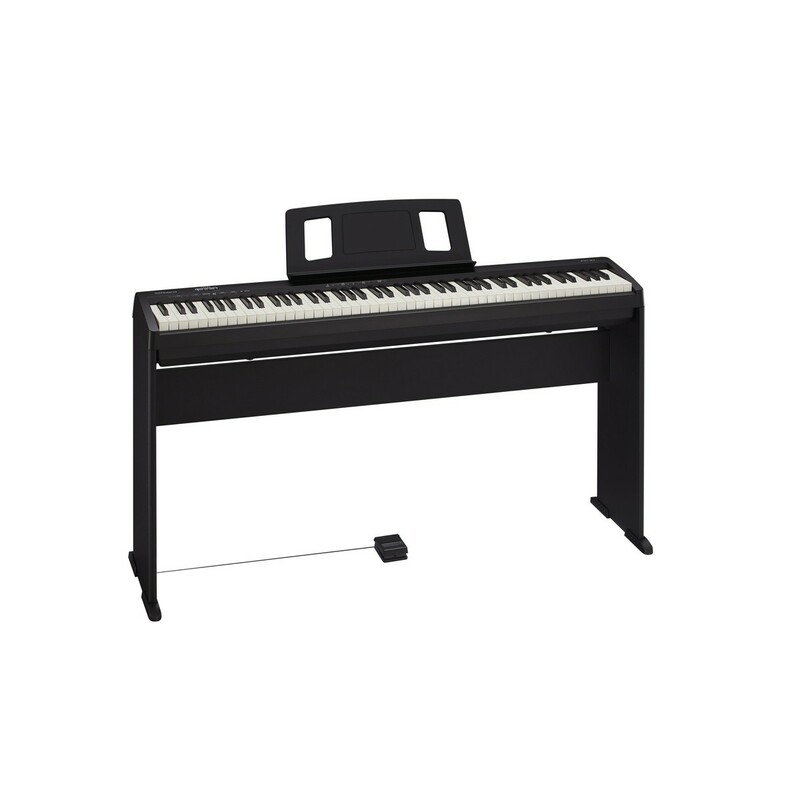 Complete with USB and Bluetooth connectivity, Roland's FP 10 Digital Piano delivers a premium musical experience previously unattainable in such a streamlined package. Purchase includes Roland FP-10 frame. Communicate your truest emotions with the Roland FP-10, meticulously designed with Roland’s PHA-4 keyboard. The FP-10 offers a dynamic playing experience, accompanied by the sound of a fine acoustic piano. With a dynamic responsive touch mechanism, the PHA-4 keyboard is sure to express even the slightest nuances. Using high-resolution sensors and Roland’s advanced escapement mechanism, the PHA-4 keyboard reliably translates the slightest differences in tone and character as you play. Whether you play hard or soft. Your sound is faithfully captured by Roland's touch-detection technology. And if you pay close attention. You will notice a heavier hammer-weight in the low registers and a lighter register in the highs. Serving you a playing experience just like the touch and feel of the acoustic grand piano. Touch the white keys and you'll be convinced by a revolutionary moisture-absorbing material that recreates the natural texture and feel of real ivory. The absorbent key surface is carefully designed to give you total performance control. Working against perspiration, the ivory-like keys help you maintain a firm grip on the keys for the duration of your performance. You won’t find anything like it. There is no other digital piano that maintains the same tonal quality - on the market. Rolands SuperNATURAL sound engine produces incredible, dynamic tones that bring your music to life. Whatever level of skill and experience you have, the FP-10 is perfect for learning core techniques. Better yet, it’s an excellent choice or an experienced player who demands detailed articulation and response. All thanks to Roland, the dynamic piano sound comes flooding into your room through the powerful on board speakers. Or you can play with no interruption, at any time, of any day, with your headphones. After years of intensive research and development, Roland have developed an incredible way to incorporate both the old and the new. So now you can experience the best of both worlds. While maintaining a traditional touch, Roland incorporates a range of all new digital innovations in the FP 10. So you can explore a world of endless possibilities in music creation. The FP-10 offers an incredible range of on-board sounds and effects all included to inspire your creativity. Regardless of your musical style or genre. Learn faster with the Twin Piano Mode. With the FP-10 you can learn and play side by side with your teacher in the same key range. What’s more, the Bluetooth and MIDI connectivity, allows you to connect to a world of Digital Audio Workstations (DAW) and music creation apps ranging from Apple GarageBand to Roland’s Piano Partner 2. (*Please note: The rhythm function is not available on Piano Partner 2).